Central small bar with quality tapas and fantastic cocktails. Andaluz was reviewed on Wednesday 28th March 2012 16:53 by Richard. Small bars are really taking off around Australia and for once the trend is not lost on Perth. It seems as if there is a new small bar opening it's doors just about every other week. 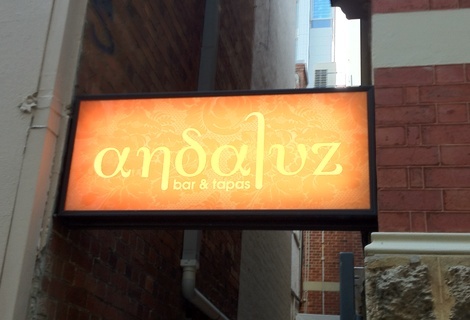 Andaluz is one of the pioneers of Perth's small bar scene, being open for over three years now. Located on Howard St in the CBD, Anduluz is in the perfect location for an after work drink or even a place to go before a big night out on the town. I headed down with a good mate for an after work drink and quick bite. Walking into the bar (through the laneway style entrance) you quickly realise that the place oozes class and sophistication, from the big leather couches to the bar stocked with top-shelf names, there's no mistaking that the joint is classy. Most of the patrons are suits that seem to be on client meetings, you'd stick out like a sore thumb if you rocked up in shorts and a t-shirt. Eventhough it is one of Perth's fancier small bars, I wouldn't say its fancy to the extent of being pretentious. I still got a chilled out vibe from the place and we were greeted by one of the waitresses as we walked in and shown to a table. One of the things I love about Andaluz is that it's slightly below street level and gives it a sort of trendy feel you'd expect in a New York or London bar. I've been to Andaluz quite a few times in the past, mostly for cocktails, which are generally amazing. The guys behind the bar definitely know what they're doing and make one of the best Mojitos going around. As it was a Wednesday we opted to have slightly less potent beverages and ordered a couple craft beers (Sierra Nevada Pale Ales from The Sates, which were great). As far as drink range goes, it's quite large for a small bar, there were a few different beers and ciders to choose from, a more than decent wine list and a fair few cocktails. Food wise, there are a selection of tapas style dishes, ranging from about $15 to almost $60 (for 60 grams of iberian ham!). We ordered three dishes, mostly from the lower price range, to share between us and another round of beers. The service on a whole was great, waitstaff were friendly and efficient. The food was on the table within twenty minutes of ordering and it all looked great. We ordered sautéed mushrooms with pine nuts and blue cheese, buttermilk chicken wings and prawns with a black bean salsa. 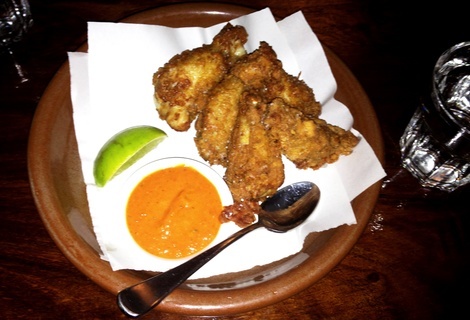 The stand out dish for me were the buttermilk chicken wings, they had a perfectly crunchy batter that wasn't too heavy or oily and a really great flavour too, I'll definitely be coming back for these sometime very soon. The mushrooms were also great and quite filling. 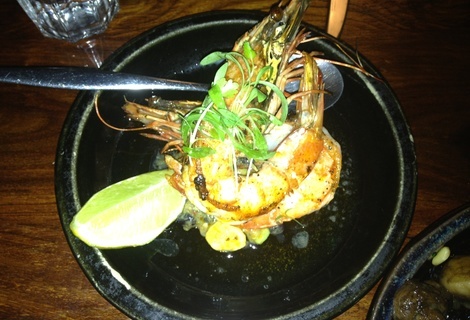 The prawns were a touch over cooked but still quite good although I thought they were a bit pricey. $14 for two just slightly larger than average tiger prawns is a bit excessive. Value on the whole is a bit debateable, some might argue that you have to pay for quality and therefore its a bit expensive, which I agree with to an extent, but I still think it is a touch over priced, which would be a deal breaker if the food, drinks or service was not up to scratch, which was definitely not the case on this occasion. Andaluz is great spot for a drink in the city or even a light meal, but if you're after a larger, heartier meal (which would consist of quite a number of the smaller tapas dishes at Andaluz) be prepared to fork over a substantial amount of cash. We shared 3 dishes and I was still pretty hungry an hour or two later. The quality was definitely there though, which counts a lot in my book and I'd be more than happy to recommend Andaluz to anyone looking for a good bar and some quality tapas in the city. 8/10Helvetica Bar in Perth, WA (13m away)Trendy little whisky bar tucked away between the office towers of Perth. 7/10Greenhouse St. Georges Terrace in Perth, WA (64m away)Hippy heaven, an environmentally friendly place with great food. 8/10Lalla Rookh Bar and Eating House in Perth, WA (93m away)Inconspicuous, modern inner city bar – outstanding food and great value.